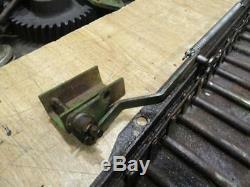 John Deere R Diesel tractor Radiator shutter Part number AR594R This is a very hard to find shutter in this condition. 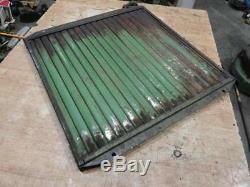 This shutter would be good for a perfect original tractor or an expo quality restoration. The shutter really does not have any issues. It works perfectly and opens and shuts smoothly. The frame work and all the fins are nice. Nothing is bent, twisted, or rusted. This shutter is solid, with no chance of being thin anywhere. It would be hard to find a better used shutter. 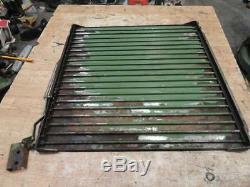 John Deere R Diesel tractor Radiator shutter. This is a very hard to find shutter in this condition. This shutter would be good. For a perfect original tractor or an expo quality restoration. Parts Inquiries and General Questions Welcomed! Styled A B G 50 60 70 520 530 620 630 720 730. ALL INVENTORY IS NOT LISTED ONLINE PLEASE CALL. Be sure to add me to your favorites list. Get Images that Make Supersized Seem Small. 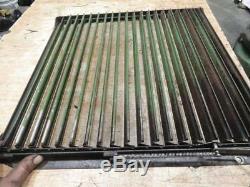 The item "John Deere R Diesel tractor Radiator shutter Part number AR594R" is in sale since Sunday, November 4, 2018. This item is in the category "Business & Industrial\Heavy Equipment, Parts & Attachments\Heavy Equipment Parts & Accessories\Antique & Vintage Equipment Parts". The seller is "millertractoron480th" and is located in Kalona, Iowa.